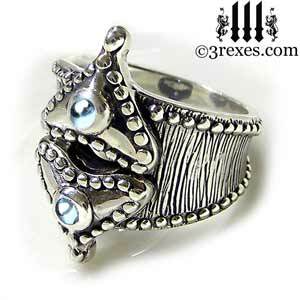 Gothic silver studded fairy tale ring with double hearts, signifying the love and union between two souls. Inspired by the whimsical world of Alice in Wonderland! During the Middle Ages, the heart icon was used to signify sincerity and clarity in art and chivalric literature. The heart was seen as synonymous to the Holy Grail. Making this not only a ring of power and prestige, but a ring of spiritual grace. Amazing ring!!!! Thank you so much Tara - you are amazing and wonderful to deal with! Tara's wonders are a gift to the eyes ! nWarm and friendly customer service, highly recommended seller ! fast shipment, great doing business with you! Worthy of a rock goddess! 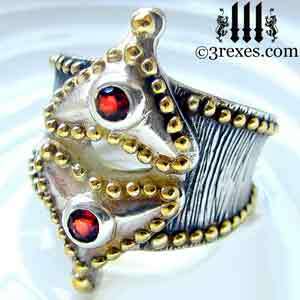 Fairy Tale Ring - shipping quickness bordering on email delivery, instant, and savage style worthy of a rock goddess.